"The goal of the mimetic space is to create deeper understandings through the partial identification that lead to both authentic feelings of respect and understanding of the knowledge and perspectives of others, as well as to instill a clear sense of boundaries to mitigate against the dangers of appropriation .... 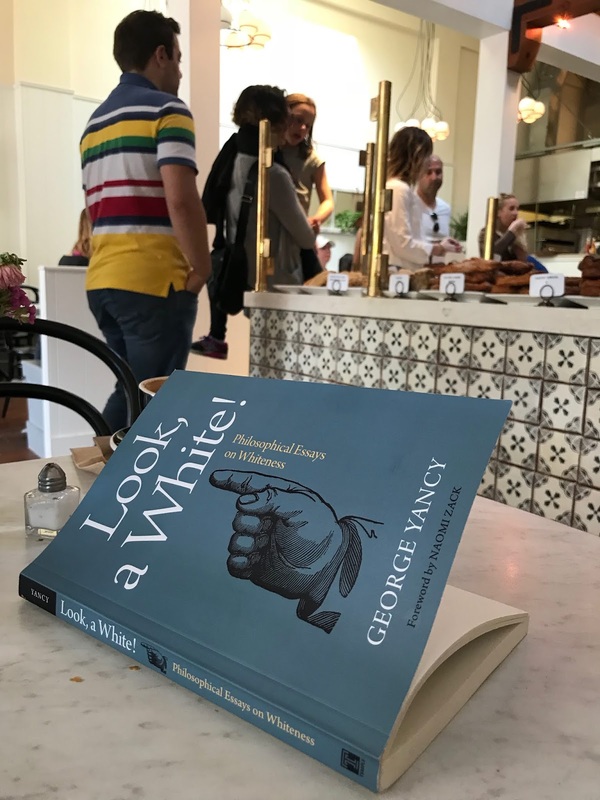 The use of storytelling has the potential to produce a mimetic space resulting in new understandings beyond the usual Western perspectives operating in classrooms." "The Production and Use of 'Mimetic Space' in the Classroom"
At BATS, our teachers Rebecca Stockley, Paul Killiam, and William Hall led our diverse group of 15, which included tech execs, retirees, financiers, preschool teachers, and health workers in shouting “Yay!” as a mark of celebration whenever someone froze, lost their way, or failed in some other manner, mostly as a result of inattention, self-consciousness, or fear. By the end of our four-days together, I too held Stockley’s belief that by virtue of being born we each carry a felt knowledge of storytelling conventions and its myriad culturally nuanced patterns. The urge to play with narrative, its rhythms and its rules, are, indeed, held within our DNA. Writing structures, including the composition forms I’m responsible for teaching, are related to storytelling frameworks. It’s helpful to remind students of this because what we naturally know and already intuit about these structures can make composition’s roots more explicit and easier to master. Starting with story can demystify what is often a traumatizing subject for students––writing. They carry tales of classrooms where they’ve been shamed for “bad” grammar and an inability to reproduce the rigid formulas that arise not from authentic writing practices but because of what I believe are misguided notions; students have nothing to say and, therefore, need to be told how to say it. Stories offer a relief from the shame and fear such approaches engender. In this way, storytelling is connected to other mindfulness practices that can restore balance, harmony, and even hope to an individual as well as the collectives within which they are learning. The storytelling and improv games we played at BATS helped our group quickly become a collective. Upon gathering that first Thursday, we were strangers. Three hours later, and for the remainder of the weekend we belonged to one another. The simplest of improv games, such as “Pick-Me”** and “If It’s True for You,”*** eased our tension and taught us how to playfully and respectfully inter-relate despite our different backgrounds and goals for the workshop. Fear is a part of almost every learning environment. But at BATS, I learned that when joy is an ever-present possibility, the pain and challenge of learning become easier to weather. For example, our “Yay!”s generated joy and in shouting it, we offered support, In itself a healing strategy. As a result, I found I was more willing to fail, and thus, more ready to learn. We were “radically pursuing presence,” explained Hall, which included a responsibility to understand our own needs moment-to-moment. To assist us in this, we were explicitly given permission to make choices throughout our many hours together. Were there times we’d rather observe rather than participate? Then, by all means, we were told, take a seat. Improv games work best when presented as invitations not mandates. More recently still, I attended the annual Association of Contemplative Mind in Higher Education (ACMHE) conference in Amherst and was re-introduced to the exciting work of Dr. Traci Currie and Dr. Lenwood Hayman, Jr. Each had been using improv in their classes––Currie communications and Hayman public health –– at the University of Michigan-Flint. They integrate improv into their work because they understand––improv can establish more humane learning environments and better societies. This is because, in addition to its roots in storytelling and survivorship, improv games are well-known for revealing how power and social stratification operate. These are heady dynamics to explore in environments as stratified as colleges and universities, places where a desire for success is great and competition, though often unspoken, ever present. What improv can do, as Currie explained it, is transform “the word power into play.” When people spontaneously create something together, we are transported “to where and who we are in that moment,” said Hayman. That in itself can be liberating as I had already experienced for myself back in San Francisco. This liberating sensation was again reignited when Currie and Hayman had our group––thirty or so academic-types––who’d gathered in a conference room for their session, spontaneously create and record a song together in under 15 minutes. We used nothing other than a beat provided by Hayman, a single microphone, and a computer program. Everyone in that room, contributed to the song’s beauty, and in so doing were relieved of having to operate with the calculation more common at academic conferences. Instead, we got to experience collective and collegial spontaneity. 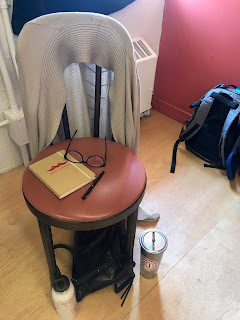 With all this in mind, I present four arguments for bringing storytelling and improv into colleges and classrooms, especially, perhaps, those that are writing intensive. 1) Playing together creates goodwill and explicitly teaches skills for interacting in a healthy, playful, and respectful manner. Equally importantly, improv trains mind and body how to take risks and greet “mistakes” with enthusiasm and curiosity. This is incredibly useful for learners, especially inside a writing classroom where many students have already experienced a deep sense of failure and shame around their writing due to the rigid and punitive ways it is sometimes taught. 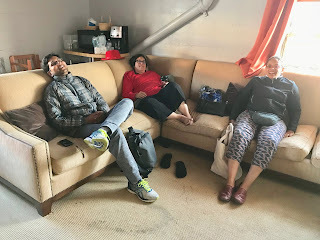 2) Improv is a concrete way to demonstrate what presence (a mindfulness term indicating conscious awareness established in equanimity) looks and feels like. Likewise, it can show, in real time, how an absence of presence impacts us as social animals. After all, it is through their ability to be present to one another, that actors create compelling scenes. Even when the lines are fiction, the connection must be real. Improv games can teach, among other things, how important the breath is in achieving connection. 3) Wherever there are differences between students and students and students and teachers in terms of race, ethnicity, class, gender and/or sexual identities, improv creates a third space––a place where each participant can try on and experiment with other discourses and discourse communities with playfulness and abandon. At the same time, because improv draws on the subconscious (very helpful to writers) society’s shadow sides are also invited to come forward, and some of its “hidden” features are exposed and more easily reflected upon. For example, the ways in which status and hierarchy are conveyed and authority is maintained through even small gestures becomes explicit in improv games. 4) Finally, our colonial histories are ever-present and continue to shape classroom dynamics and composition frameworks today. Some discourse communities and histories are favored and celebrated, while others are ignored or denigrated. Our students’ home language and ways of being are often named as something they must set aside in pursuit of academic success. By bringing improv’s storytelling concepts forward, we can show narrative’s rootedness in survivorship. This is a beautiful and meaningful thread to draw on, one that can help students see and name something precious already operating in their own lives and the lives of the their ancestors, family members, and communities. Much has been written about improv principles and methods and the “rules” for many games can be accessed online. I recommend starting with Johnstone’s Impro: Improvisation and the Theater. Better yet, make your way to San Francisco and enroll in a BATS workshop and find out more about Currie and Hayman’s connecting improv, education, health, healing, and social justice. Currently, they are working on a paper documenting their work and developing educator trainings. Check back here for more information. 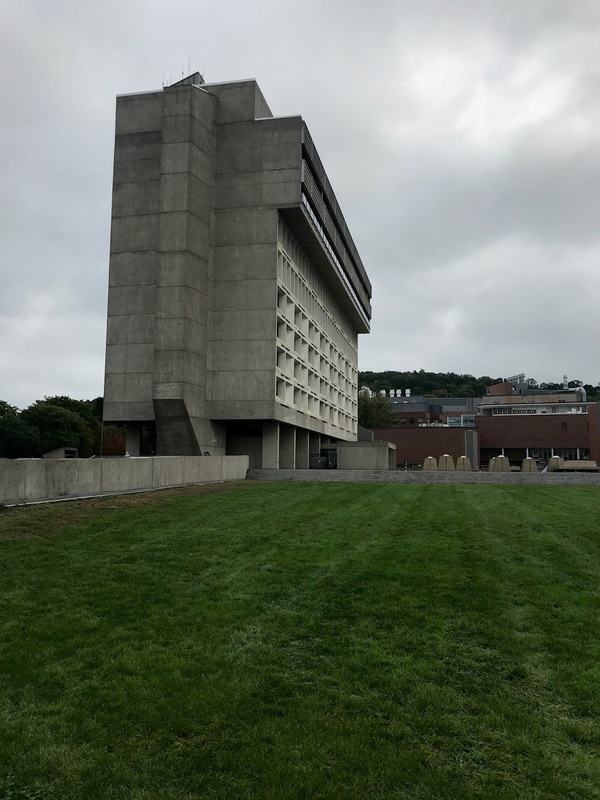 * I enrolled in the workshop this summer as part of a semester-long sabbatical project, which is described in more detail here. ** As taught by BATS instructor Killiam, “Pick Me” is a game of exaggerated facial gestures where players open their eyes wide, raise their brows, arrange their mouths into near half-smiles, and slightly nod at one another. In this way, partnerships are formed and reformed quickly. Group members make eye-contact with one another, wearing their pick-me faces, in order to pair-up and create teams. *** ”If it’s True for You” is an icebreaker game with a lot of quick movement around a room. One person starts by saying something that is true for them. “I love dogs,” for example. Anyone who also loves dogs rushes to be near them, forming a clump of like-minded dog lovers. A moment later, someone else, perhaps a non-dog lover, says from across the room, “I don’t,” or “I love cats!” or “I eat bacon,” and anyone else for whom that is also true reforms into a clump near them. In this way, relationships are quickly created and lost and recreated again in a spontaneous and surprisingly informative manner. Soon you will know who loves dogs, who’s been to Rio, and who has never had the flu. The movement of bodies around the room is key to this game’s success! **** “Act Off” is a game Hayman and Currie taught that walked us through this process, moving from dehumanization into joy. Each participant took to the stage, pantomiming their role as they felt they played it at their home institutions. Each enacted the gestures and body language of a diminished self. Then, after a moment or two, we took a breath, stood loose and tall, and reenacted a more liberated and empowered self, moving about the stage as if there were no restraint and only freedom in performing our regular tasks. Sabbatical Project: Look, a White Lady on Sabbatical! 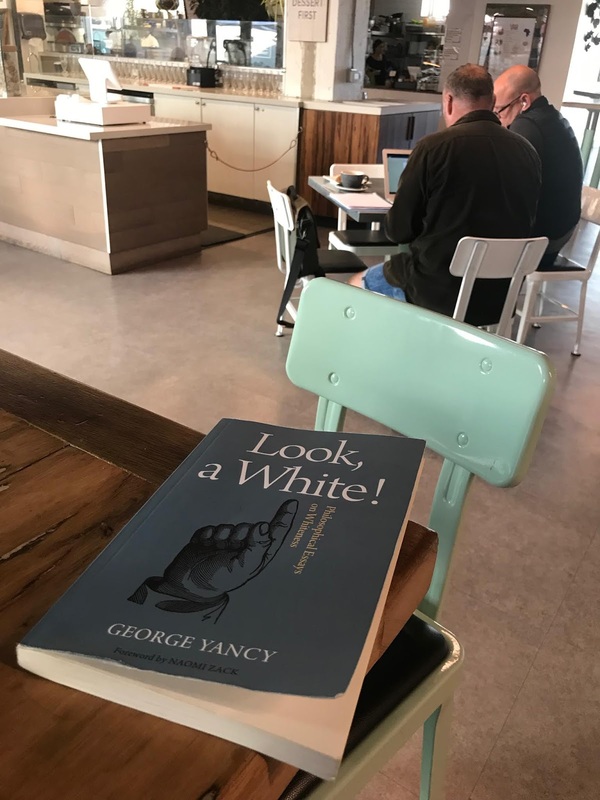 ––George Yancy, Look, a White! One joy I’ve experienced while on sabbatical has been discovering a bounty of theoretical frameworks regarding whiteness and new vocabulary for the set of structural and behavioral practices that term describes. 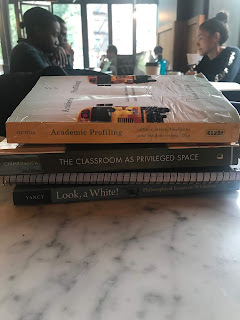 For white teachers, such as myself, it should now be easier than ever to enter uncomfortable but nevertheless necessary conversations about the impact our whiteness has on students. Among the radically expansive thinkers who are developing these conversational pathways are George Yancy, an African American philosopher who provided the epigraph above. 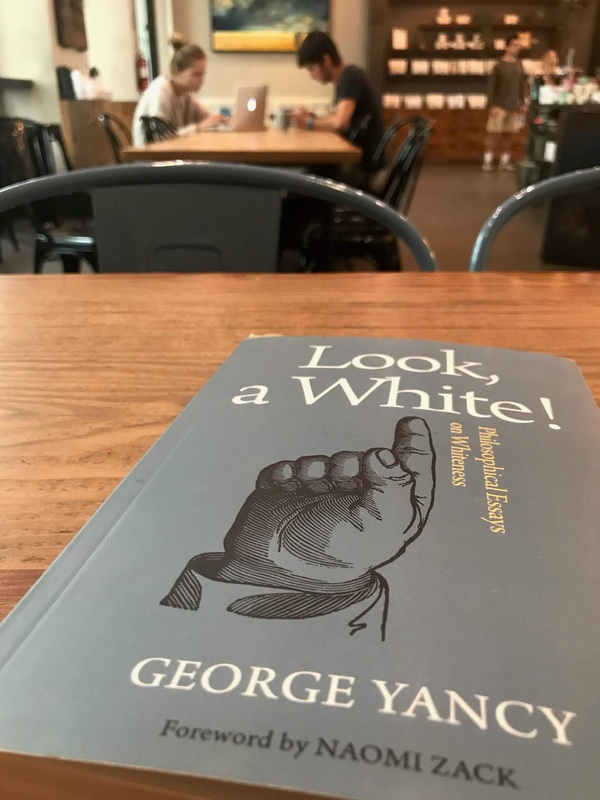 In his compelling book Look, a White!, Yancy asks that we* “flip the script” in our thinking about racism. Rather than focus on people of color when we think about race, he wants us to thoroughly, philosophically, and honestly interrogate our own social, cultural, political, and economic positioning. This is a corrective to the misconception that because racism is an immense and on-going problem for people of color, the problem is theirs to solve. 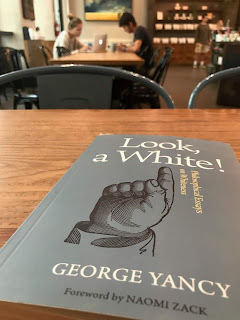 Racism belongs to white people and to achieve social transformation, Yancy says, we must be willing look deeply at the myths and fantasies (many unnamed and unrecognized) that allow us to continue to benefit from race privilege at people of colors’ expense. He asks white people “to tarry,” slowing our responses while sitting with all that arises when our own racial and ethnic identities are named, problematized, and analyzed, something that people of color in the United States must contend with daily. There is a growing body of mindfulness practices that may allow white people to fulfill Yancy’s request. Utilizing these can help us avoid the sometimes overwhelming urge to flee, hide, or deny when we look at our status and privilege. Ruth King’s Mindful of Race: Transforming Racism from the Inside Out is one such book, one that came highly recommended, and that I look forward to reading soon. In the meantime, books such as, Historian Nell Irvin Painter’s The History of WhitePeople, Gilda Ochoa’s Academic Profiling: Latino’s, Asian Americans, and the Achievement Gap, Tapo Chimbganda’s The Classroom as Privileged Space: Psychoanalytic Paradigms for Social Justice, and Robin DiAngelo’s White Fragility: Why it’s so Hard for White People to Talk about Racism, have helped me understand that while whiteness is a biological fiction, it nevertheless materially affects the world and shapes everyone it in it, including the individual psyches of white teachers, such as myself, and all the students we serve. 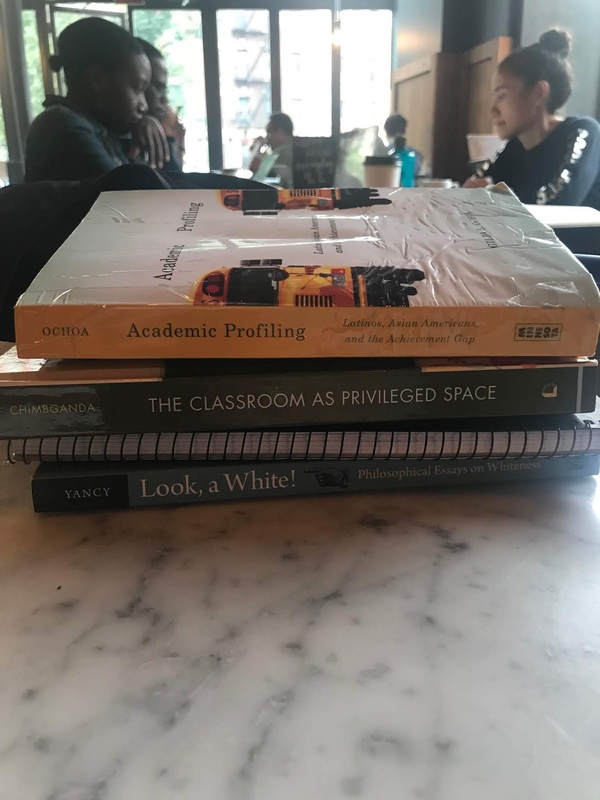 These new-to-me methods for looking at whiteness and the fresh language these books provide for naming its impacts seemed unavailable to me the last time I invested this deeply and explicitly in social justice work. That was more than two decades ago in New York City during the AIDS crisis. I recall white activists attempting to work with people of color from inside a certainty that all our assumptions were correct. We were overly invested in these perceptions and overly confident in our analysis, arising from what was an unconscious, but nevertheless powerful, belief in the objectivity of our perspective combined with a natural intelligence. All our proposed actions built from this broken place. But it couldn’t have been clearer; despite the crushing effects of homophobia, white gay men and people of color, including gay people of color, experienced the AIDS crisis differently. We just didn’t think that mattered, and we white activists knew best, or so we thought. I saw that we disappointed and even betrayed the trust of the people of color groups with whom we tried to form coalitions. I witnessed one such group walk away. We, somehow, were bewildered when they did. In light of all this, the best any individual white activist could do was attempt to prove our goodness despite the racism we knew existed somewhere out there, beyond what we thought was our own realm of agency or responsibility. This often meant some other white person in the room needed to be identified as the bad white, if only to preserve the myth of our individual innocence. 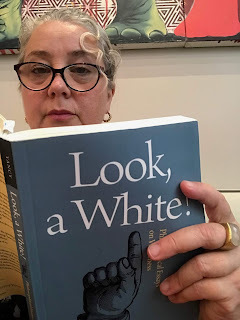 In her book White Fragility: Why it’s so Hard for White People to Talk about Racism, DiAngelo attributes this dynamic to white people’s false understanding of racism. If we think about racism at all, most white people see it as grounded in the individual acts of bad people. In so doing, we cut off conversations about its deeply rooted structural elements, elements which normalize and privilege our own experiences. DiAngelo’s book is about the many unconscious strategies white people have developed for cutting off conversation, thus, avoiding accountability and responsibility for the oppression from which we benefit (regardless of how much we also suffer from it in other forms). In this way, structural racism continues to flourish, diminishing the lives of people of color, and deeply thwarting our own humanity too. Back in the nineties, though, white activists seemed to have nowhere to go with the peculiar mix of blindness, aggression, and shame, which is also common to our people at this time, in this place. That’s why two little words “white fragility” are so precious to me today. To name a thing is to know a thing, to bring it forward even as it does its best to stay unnamed, unseen, and unconsidered. My hope it that in examining my own whiteness and how it functions within my school and the larger systems within which it too operates, I will be better able to engage in richer more meaningful dialogues with students, teachers, and administrators alike and fulfill my teaching responsibilities more effectively. Chimbganda encourages teachers to draw on the messy dynamics of transference and counter-transference to help navigate such challenges. Her book on the interplay between classrooms, social justice, and psychoanalysis, is especially good at laying out the psychological dynamics and consequences of keeping parts of ourselves unexamined and in the shadows. When coupled with racist ideologies and structures, the damage this does to us as children, and by extension the adults we become and the societies we develop, is immeasurable. Hers is the most profound book I have ever read about teaching and learning, and I hope everyone I know reads it. The shadow’s presence in an educational context means we rarely-to-never name the actual dynamics of an individual campus. In the case of the school where I work, most faculty and administrators are white and most students are not. This is true despite the fact that study after study indicates students of color find greater support and connection, and, ultimately, success through educators and curriculum that mirror and reflect their own ethnic experiences. Likewise, study after study also shows white students benefit from the presence of faculty of color, who seem to more consistently build good learning relationships with their students. But we haven't talked much about what this means for us as white instructors, and I think it would illuminate a lot about our teaching practices if we did. It’s easy to see that the hiring practices on my campus arise from the larger societal inequities within which it operates. Another of these is the fact that most instructors on my campus are part-time, hardworking people who are paid less per hour than I am for doing the same work. Their status and working conditions also affect students’ learning. But this structural inequity is another that rarely gets reflected upon when we examine, as we do more and more frequently, data meant to tell us all we need to know about student success and failure. Data and its uses, misuses, and the myths it supports are at the heart of the Ochoa’s book on the dangers of what she names "academic profiling," which is related to "stereotype threat," something social psychologist Claude Steele has written a lot about. By focusing on data, educational institutions can appear to drill down into foundational truths about learning and success without ever addressing what affects them most: power and inequality. Ochoa’s book is a lengthy and powerful case study of the very “Southern California High School” from which she graduated. In it she names that phenomena as a “power evasive discourse,” showing how it limits system-wide transformation and blinds teachers to their students’ actual lives, abilities, beauty, and fullness, condemning everyone involved to the same outcomes and unrealized potential. However, when educators and schools open themselves to “power aware” discussions, Ochoa says, they are better equipped to hear what students have to offer and what they actually need. From here our ability to respond in a human, heartfelt, and meaningful way increases. My hope is that once my sabbatical is completed, and I return to my campus and the classroom spaces where I operate with all my promise and also all my flaws, I am able to live up to the wisdom, beauty, and humane practices these scholars have uncovered and named. The language they’ve developed to do so is a treasure, one that should be shared. * Though this post is meant for every reader who’s willing to make their way through it, I’ve used the collective “we” throughout to refer to myself and my white peers. In doing so, I hope to make an identity that is often unnamed, and consequently hard to see, more visible to myself and my readers. Thank God, I had the opportunity to teach a stand-alone reading class last semester. It seems it’s only when we teach something we truly learn it. 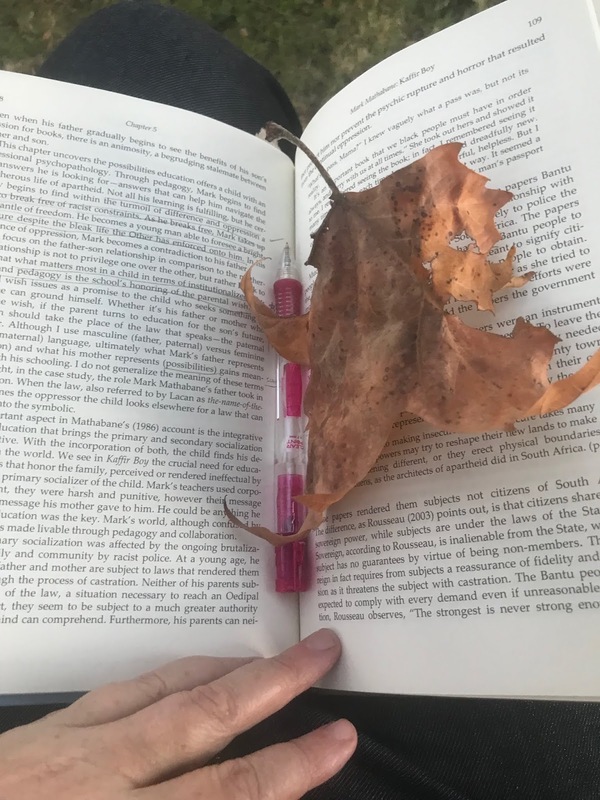 Somehow I’d completed college and two graduate programs without the reading strategies necessary to integrate what I’ve been learning during my sabbatical project, which you can learn more about here. Reading texts thick with unfamiliar concepts and fresh ideas has become an almost physical experience. I open these books, pencil in hand, pacing my reading rate by the marks it makes. 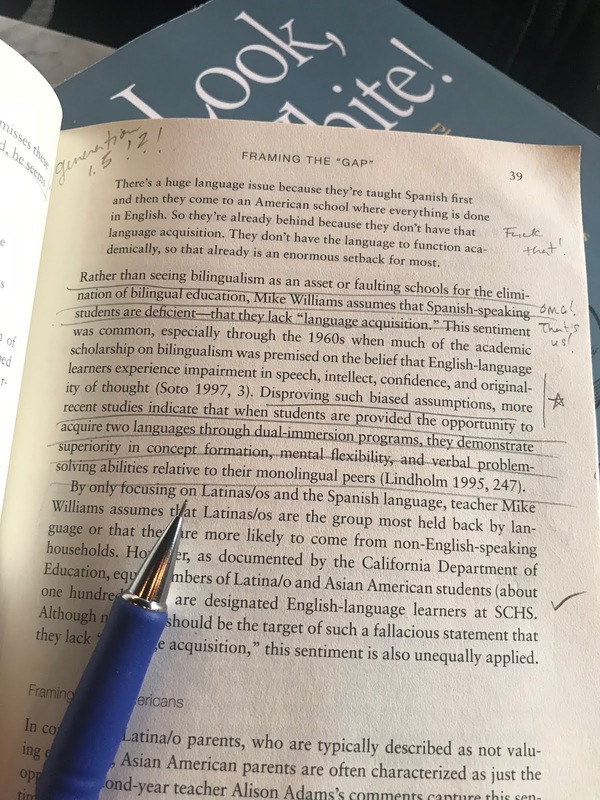 As I go, the pencil underlines, questions, and fills margins with stars, exclamation points, and connecting thoughts and comments. Rather than merely listening to an author, the experience is akin to having a conversation with them. They make statements, and my pencil offers its emoji-like responses. Each writer’s words flow through and across my own consciousness triggering subtle neurological responses. A brain cell alights and suddenly an idea on one page connects to another in a novel way. Like a magic-trick, terms I’d never come across suddenly describe things I’ve often seen in my own world but had left unnamed. Therefore, what had only moments before been nearly invisible to me crystalizes into a tangible and meaningful shape. It’s humbling, enlivening, and thrilling all at once to experience this sensation page after page––concepts that explain learning conditions I’ve worked within for all my professional life, but have never been able to truly understand, come fully and freshly into view. Without sabbatical, I’m not sure I could expand my thinking with such freedom and abandon. Had my sabbatical not been granted, I would have had to cram this kind of intense study into a semester break (which are longer than most professionals’ and for which I remain ever grateful). But unbeknownst to me, such cramming narrows what I’d be able to take from what I read. With one eye on the calendar, I would feel pressure to pull out only those ideas that applied directly to what I’d be teaching next. Even more limiting, I think I’d unconsciously reject ideas counter to what I was already doing in my classrooms. Taking in a radically new perspective is almost impossible if one lacks the time and space necessary for the reinvention and integration that are a meaningful idea’s natural consequence. And because much of what I’m reading describes system-wide structural phenomena that hurts students (and by extension society), it will ultimately, require collective degrees of change to ameliorate, meaning it requires changes in my classrooms, yes, but far beyond it as well. When I return to campus, I will need to attend to both, which means I must be in community with others to create transformation. A sabbatical framework means I’m meant to think this broadly. Certainly keeping in mind my campus, a rural community college on the southern end of the Silicon Valley, and my role on it but also education as a whole and its larger purposes, imagining alongside others what it might be and become. Surprisingly, I’m finding this expansiveness invites greater clarity and precision instead of less. I find I see both a general context and a particular place with greater distinction. I now recognize there are patterns in the ways educators are being pushed to name problems and solutions on our campus. It isn’t that California has suddenly and magically aligned with the top-down reforms also happening in other states. Rather, my college like every other campus in the US, and maybe even all over the developed world, is being pushed toward certain types of educational solutions because global business and political interests want it that way and not because that is what is best or most humane for students and workers alike. The thinkers I’m now engaging offer alternative perspectives and a critique of solutions being promoted across the nation and on my home campus as well. However, I find my brain isn’t as nimble or as masterful as it once was at retaining new ideas. That’s where last term’s reading class also comes into play. I know what needs to happen in order to integrate the thoughts of writers and scholars as varied as Chimbganda (quoted above) George Yancy, and Gilda Ochoa. It’s all in the reading strategies I taught last term. Here’s what I’m doing to make it most likely that what I’m reading won’t disappear into a gaseous vagueness once I put a book down. As described above, I read with pencil in hand. I mark key ideas and anything that excites me (only sometimes ever the same thing) by using explanation points, stars, or simply a check mark in the margin between paragraph and page’s edge. Sometimes, if I’m unfamiliar with a term, introduced to a person I don’t know, or a new concept I circle it. Often by page’s end, these have become clearer and are already entering my own vocabulary. Sometimes not. Nevertheless, I carry on, reading at a pace slightly quicker than feels entirely comfortable. Counter intuitively, that’s what makes it most likely I’ll be able to makes sense of what I read. Occasionally, I slow down enough to make a small comment about what I’ve read, noting how one idea relates to another in a different text or even something I’ve experienced or heard first-hand. Often, I underline something in order not to lose it, sometimes half a paragraph or more at a time. What I really want to hold close, I box up with my pencil, so it sits on the page bounded on all sides. Sometimes a portion of the page is boxed and dancing with explanation points and also stars because for me the words are burning with power. They’ve become precious to me, and my marks signify their vibrant energy and make it easier to find when I need to share them with a friend. And then there are those ideas that seem so vital, so important, so filled with a potential to make education better, to free not only students but teachers too, that I mark them with a heart––a heart to signify what I hope stays with me for decades of teaching to come. One text, then another. A new dialogue between writer and reader arises. A fresh voice enters my conscious, and I sense the old author’s voice drifting away––still a part of a background melody, perhaps, but the lyrics no longer as fierce as they had been only hours ago. I know I’m in danger of being unable to share what I’ve learned with the integrity required. For this there is only one solution––the annotated bibliography. I’ve adapted this old composition classroom form in the following way: I write an overview of the text, then talk about how it applies to the sabbatical project as a whole. Next, I pull out important points in ways that follow the path of the book. Finally, I include the quotes and ideas that meant most to me. In typing these out, word-for-word, I find the author’s voice becomes distinct and sticky once again. I wish I could say this was a quick process. But hours of work go into these bibliographies. Some are only a page or two, but a dense text like CharlesMann’s 1491, with its dozens of facts per paragraph, grew to 20 pages. To complete an annotated bibliography, it’s not enough to read the text once marking as I go. I have to skim each book a second time, sometimes even a third, reframing each page in one or two key phrases that chart an author’s line of thinking across sections and chapters. This is what allows me to retranslate their ideas it into my own words. It is in this way, that these finally and thoroughly integrate into my consciousness, and I see more clearly how they relate to other parts of the sabbatical project. It’s tedious. It’s time-consuming. It’s delicious. And I very much look forward with sharing the results of this labor with you.